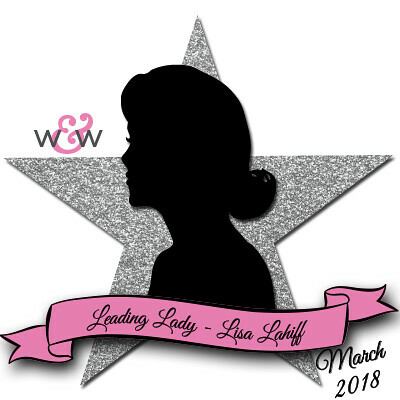 Our March Leading Lady Lisa Lahiff is back for her sensational second performance! If you missed her smashing debut you must see it...CLICK HERE. 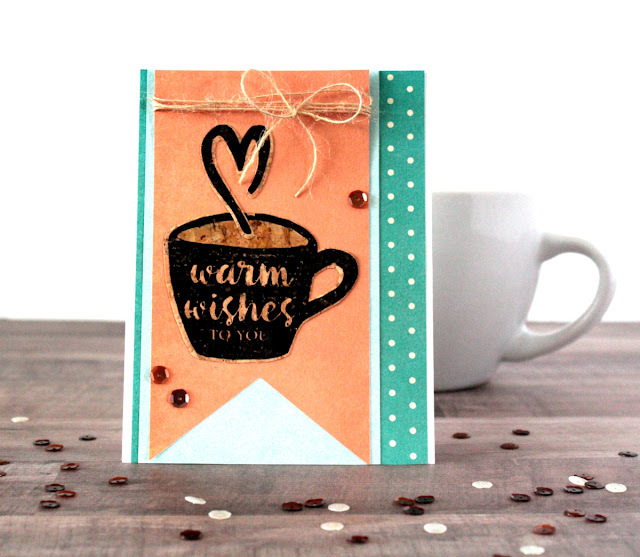 Today's bevy of amazing cards go beyond paper and are sure to make you want to try something new! Hello! I am so happy to be back with all of you again! If you were able to catch my first Winnie & Walter Spotlight post here, then you might remember that I am planning on having a theme for each of my posts through the month of March. 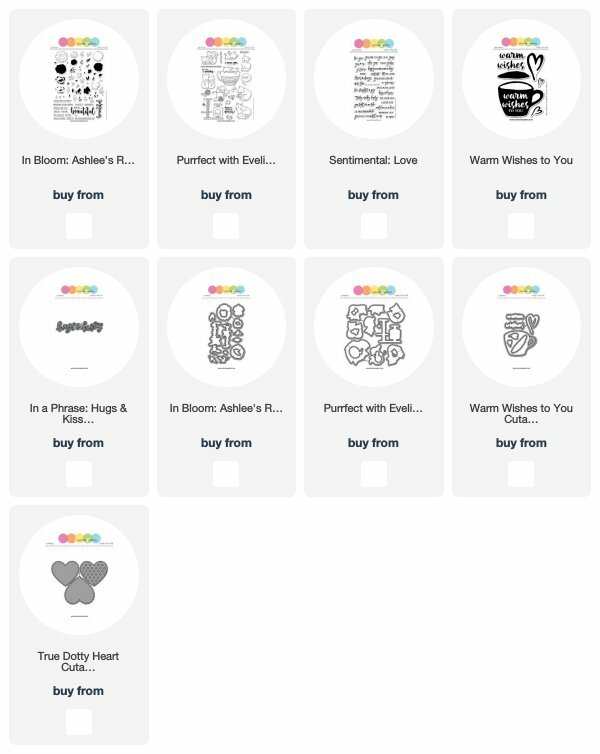 Today's post I am titling "Off the Page", and I am going to focus on various mediums you can stamp on besides paper. Don't get me wrong I love paper, and my collection can totally attest to that (as can my husband! lol), but there are lots of mediums out there that give beautiful and unique results that you may not have considered using. For this card I stamped this coffee cup and steam from the Warm Wishes to You Stamp Set right onto a piece of adhesive backed cork. I then die cut both with the coordinating Cutaways. I then added this onto a few sheets of patterned paper. As a final touch I added glossy accents to represent the liquid in the cup, and I love the touch of shine too! Isn't she too much fun?! 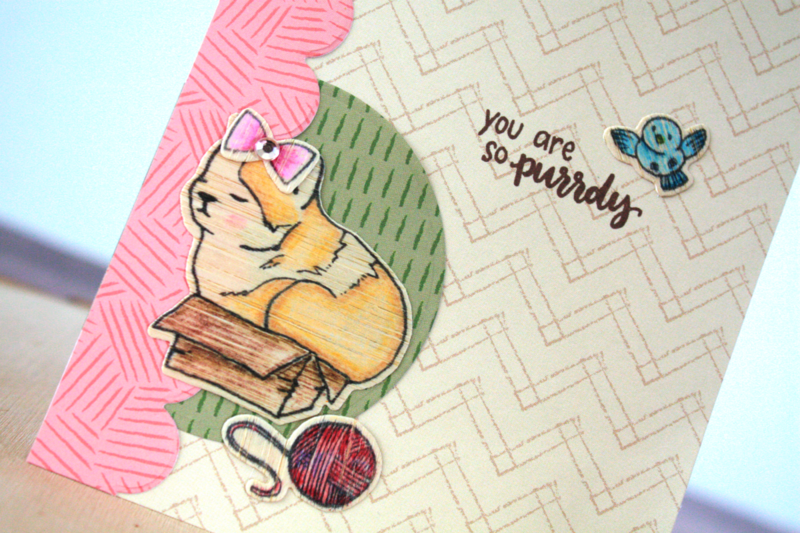 This image comes from the Purrfect with Evelin T Designs, and I've used the matching Cutaways too. My cat is always trying to fit in the smallest boxes, or game boxes when we have them out, it's just too funny! Now I knew I wanted to color my images in, but I also knew that wood soaks and spreads with the touch of inks so markers were out. The same went for watercolors, obviously they would spread as well and I wanted a nice clean image. That's when I looked over and saw my Spectrum Noir Blendable Pencils, and I have to say I'm hooked! I was surprised at how easy it was to blend my colors as well. After creating this card I already have all kinds of plans on coloring in some of those larger floral images onto this Wood Veneer, doesn't that just sound lovely? 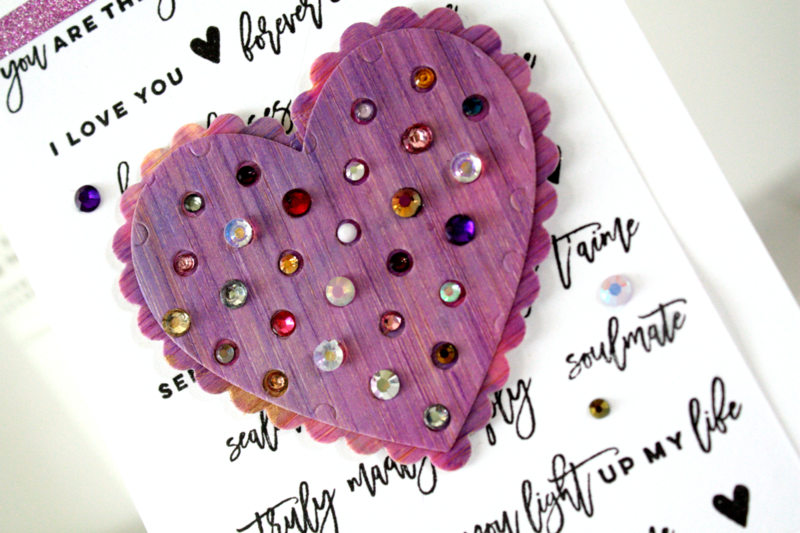 For this card I started by blending purple and pink alcohol ink colors over an entire piece of Wood Veneer. Since the ink dries quickly I was able to die cut my hearts from the True Dotty Heart Cutaways right away. And of course I had to fill all of those little dots with a fun mix of flat back gems. While these were drying, I created my background panel by stamping various sentiments from the Sentimental: Love Stamp Set. And viola! I have one final card for today that mixes the Wood Veneer with a new medium: Craft Metal. I have used Craft Metal before to emboss and die cut with, but I had never tried stamping on it so I gave it a go... and it worked! I wanted to color my stamped flowers in with Alcohol Markers so I used a Alcohol friendly ink and set it to dry for a bit before working with it. If I were to stamp onto this Craft Metal and try to color on it right away it would do nothing but smear the images. I also heat set the images just to make sure they were fully dry (make sure you use tweezers or something besides your hand to hold it when you are heating it up, or the metal may burn your hands). 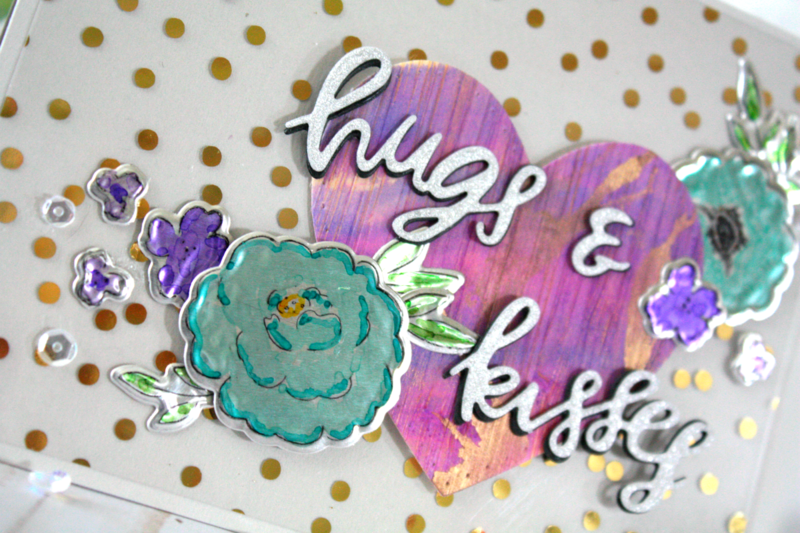 While you may not be able to layer your coloring on Craft Metal or blend colors, it will give you a watercolor look as the coloring dried, and I love it! 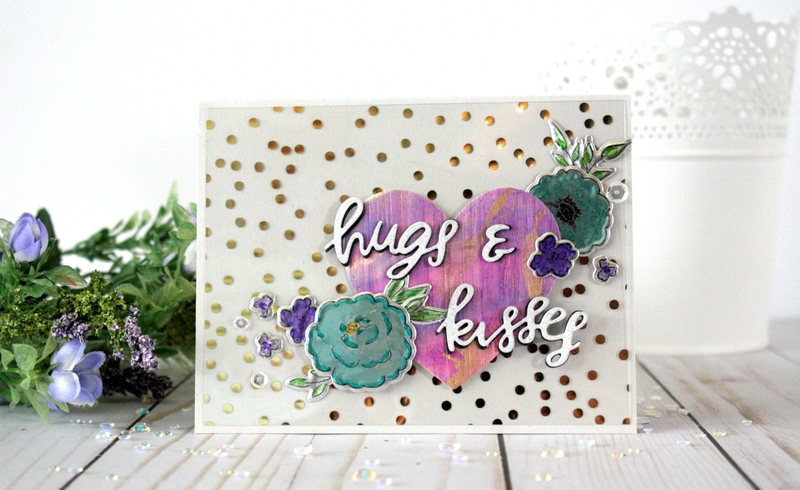 For this card I used the In Bloom: Ashlee's Rosie Posies with Lydia Evans, and it's coordinating cutaways, as well as left over Wood Veneer heart from the True Dotty Heart Cutaways. I then finished it off with the Hugs and Kisses Cutaway layered in black and silver. Whew! And there you have it! Lots of ways for you to go off the page with your crafting. Do you have a favorite medium other than paper to work with? Make sure to share it with me over on my blog! Thanks so much for stopping by today! Pretty cards! I love that Warm Wishes set! Fabulous, Lisa!!! I love these wonderful effects....esp with the wood veneer! (That kitty is too cute!!) Thank you for sharing your lovely art with us. I am inspired to get out my craft metal which has been sitting unloved in my stash for at least a couple of years!! Amazingly creative! Love your projects! 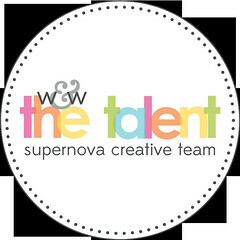 Love, love your beautiful work! These are great cards ! Fabulous cards. I like your use of unique materials. Fantastic 'experiments'! Thanks for sharing. Awesome cards with really fun techniques! 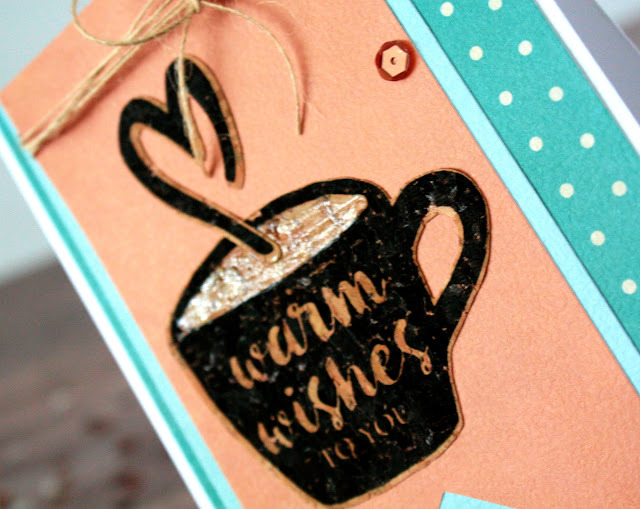 Beautiful cards Lisa..Love the idea of stamping on veneer and cork..